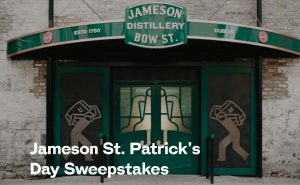 Enter before March 30, 2019 for a chance to win a 4-day, 3-night trip for four to Dublin, including airfare, hotel accommodations, and a tour of the Jameson distillery. Prize and approximate retail values (“ARV”): Grand Prize (1): A 4-day/3-night trip for four (4) to Dublin, Ireland. Trip includes round trip economy class air transportation from the major airport nearest the winner’s home to Dublin, Ireland; three (3) nights’ hotel accommodations (based on quad occupancy); a tour of the Jameson distillery (the “Distillery Tour”); and $500 spending money, awarded as a check made payable to the winner (ARV: $7,600).